Decorative Artist serving Maryland, Virginia and D.C. Best of Houzz 2019, 2018, 2017 and 2016. Providing full service decorative painting, custom artwork on canvas, faux finishes, murals, and artisan-glazed refinishing for kitchen cabinetry. Residential & Commercial Deborah Weir has been painting beautiful interiors since 1990. She has a B.A. in Fine Arts and Art History from Hood College, Frederick, MD. This combination of study was the inspiration for starting her Decorative Painting business. Faux Finishes and Trompe l'oeil Murals, which give new homes a beautiful sense of history and character, are often inspired by the past. 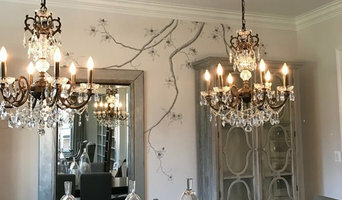 One client may be inspired to have a mural designed to look like a classical Italian fresco, and another inspired to have their walls antiqued to resemble a French country manor house. Since those early years, Deborah's work has branched out to encompass more and more exciting design options including more Transitional and Contemporary projects. From walls inspired by artist Mondrian to large scale urban loft-style feature walls. If you can imagine it, she can paint it for you! 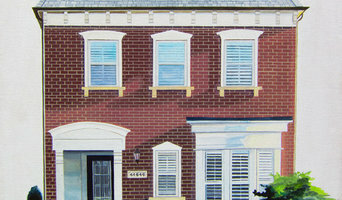 Artist who paints public and private murals and canvas commissions. Murals can be indoors or outdoors. 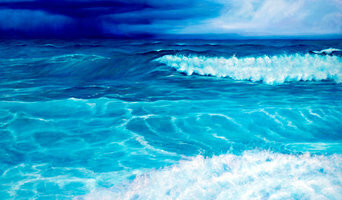 Paintings can be painted in any style or medium. Prints are available on paper or canvas. Decorative painter and artist - artistic painting and design covering walls, ceilings, floors, architectual elements and furniture, for residential and commercial spaces. Join countless happy customers who have commissioned the paintings of their dreams, whether as gifts for loved ones, for their own home decor, as nursery art for their children, murals for their home or restaurant, or even as a prop for a marriage proposal! As a lifelong Artist, I create your vision through paint, brush, pencil and ink, in a wide variety of sizes, materials and art styles, while working within your budget. We communicate throughout the process about key aspects such as the time-frame for completion and your feedback on the progress of the artwork. Custom wood framing options are also available! For any questions or to start on your own special fine art project, just leave me a message at dave@davewhiteartist.com! McLean Stained Glass Studios is Virginia's premier stained and leaded glass design service. We provide exquisite custom pieces perfect for every room in your home or business. Every piece is created by hand, and may be installed on-site by our professional carpenters. Custom stained and leaded glass greatly enhances the atmosphere of any home or business adding richness, style and beauty. McLean Stained Glass Studios is also expert in restoration and repair of stained and leaded glass. WWH Restoration provides full service art and furniture installation in the Washington DC Metro area. 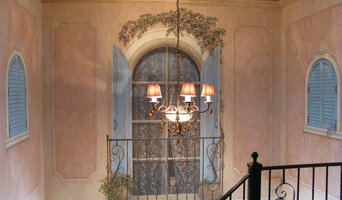 Kearns and Kang is a company with 25 years experience in producing decorative custom finishes and murals. We are designers as well as artisans specializing in giving our clients the optimal effect of style, colors and scale best suited to their needs. Minor Miracles offers artistic help on many levels. Kelly Haneklau, owner of Minor Miracles, works with clients to create their vision or help them attain one. Her specialties include custom murals, color & design consultations, artistic decorating, art lessons, and painting just about anything. She holds a Bachelor of Science degree in Fine Art and is always active in one or more art projects on any given day. B&G studio designs is a full service faux finishing , mural and fine art studio based in Northern Virginia and serves the Washington DC metropolitan area. Though best known for my coastal paintings, I am an artist Influenced by both coastal and farm surroundings. My goal is to create the perfect piece of art that both compliments and brings harmony to your surroundings and decor. My paintings and giclee prints are hanging in beautiful homes, restaurants and offices from coast to coast. Whether you are home owner, interior decorator, art collector or curator I'd love to forge a custom work of art just for you. All images shown are available in giclee print on Somerset Velvet Watercolor paper. Email paintingsbykatherinecarney@gmail.com for a quote. You can also visit my fine art print site on Etsy: katherinecarneyshop. For an complete gallery of available originals please visit my website www.paintingsbykatherinecarney.com Professional trade discount offered. Large framed prints for corporate offices and hotels available. Awards: 2017 Eastport Yacht Club Parade of Lights Art, 2016 Hospice Cup Poster Competition, Best in Houzz 2018, 2017 & 2016, 2nd place Acrylic Division 6th Annual Annapolis Maritime Museum Juried Show May 2016. Unique and custom wall art on unique finished for a bold and modern look. Original fine art and art advisory. Muralist I started painting when I was 16 years old living in Argentina, where I studied with great art teachers and painters. Later in life, I moved to the US, became a full time mom, and helped run a family business that included some graphic design, before coming back full circle to my biggest passion: painting. Painting residential and commercial murals an faux painting has allowed me to do amazing projects, travel across the country, and meet great people. I love to accommodate my client’s vision and needs, and transform a plain wall into something artistic that people can enjoy.